Ohio is one of the states that best represents America. The 17th state admitted to the United States, Ohio combines the Great Lakes region with the Midwest. It ranks seventh among the 50 states in population thanks to the presence of major cities Cincinnati, Cleveland and state capital Columbus. Second-tier cities in the state include Akron, Canton, Dayton, Toledo and Youngstown. Its namesake Ohio River separates the state from Kentucky and West Virginia. Ohio also borders Indiana, Michigan and Pennsylvania. Attractions within the state include the Cedar Point amusement park, the Pro Football Hall of Fame, Rock and Roll Hall of Fame and the Cuyahoga Valley National Park. 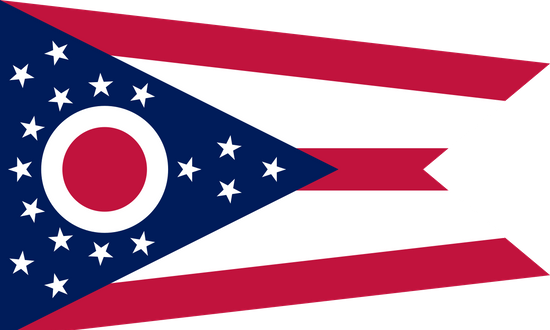 The state is home to several storied sports franchises such as the Cleveland Cavaliers, Browns and Indians, the Cincinnati Bengals and Reds, and the Columbus Blue Jackets. Numerous Interstates and U.S. highways lie within Ohio. Interstate 71 is a northeast-southwest corridor that connects "the three Cs": Cincinnati, Columbus and Cleveland, in that order. Interstate 70 runs east-west through the middle of the state, and through Dayton and Columbus. Interstate 75 is the state's western north-south corridor and connects Cincinnati to Toledo via Dayton. Interstate 76 has its western terminus at I-71, passes through Akron and near Youngstown, and forms the easternmost 25 or so miles of the Ohio Turnpike before continuing into Pennsylvania as the Pennsylvania Turnpike. Interstate 80 makes up the rest of the Turnpike, taking over from I-76 west of Youngstown; Interstate 90 joins to the west of Cleveland. Interstate 77 has its north end at I-90 in Cleveland, and goes through the Akron-Canton area before crossing the Ohio River into West Virginia in the area of Parkersburg. Interstate 74 has a few miles in the Cincinnati area. The state's three-digit Interstates include the Interstate 275 Cincinnati Beltway, Cleveland's Interstate 480, Youngstown's Interstate 680 and Interstate 270 around Columbus. U.S. routes 62 and 68 zig-zag through the state. U.S. Route 40 parallels I-70 closely. U.S. routes 24, 224 and 422 provide northern surface corridors for the state, as does U.S. Route 20, which follows Lake Erie for most of its length through Ohio. U.S. Route 35 runs diagonally in the opposite direction of routes 62 and 68. U.S. Route 30 finds itself sandwiched in between routes 20 and 40 through the state. Click or tap below to see photo guides for Ohio Interstates and U.S. routes.